Donnelly MSO 50mm Tire: Getting Rolling- by Guitar Ted The gravel cycling world has always featured bicycles of various types within their ranks. One could be forgiven if they only recently started paying attention to this genre and thought that 35mm-45mm tires defined the segment. 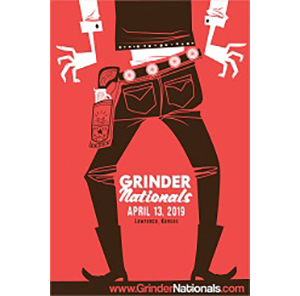 While that is where the industry has decided to focus on as far as tire size and clearances go, that does not define what you will see at many gravel road based events. Bicycles with bigger tires are common. Mountain bikes, bikes with “plus” tires, and even fat bikes are “gravel bikes” in the real world gravel cycling culture. This is why at Riding Gravel we have been taking a closer look at some larger tires of late like the Terrene Honali and the Soma Cazadero 50mm tire. 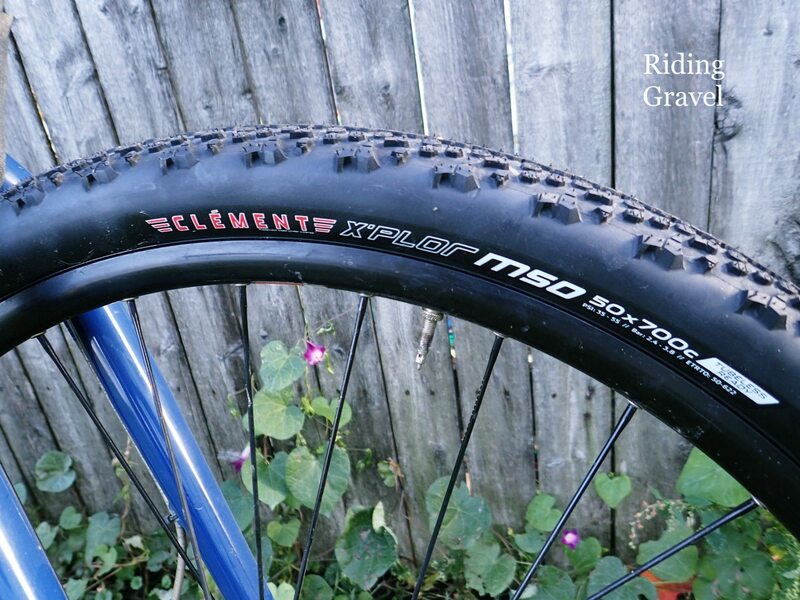 This time we turn our attention to another bigger tire with gravel cycling roots in the Donnelly MSO 50mm. The Donnelly 50mm MSO….yes, it says Clement, but that part has changed recently. Same Tire- Different Branding: The “MSO” part of the name of this tire may be familiar to many of you. That is because Donnelly used to be known as Clement. The Donnelly Sports name is owned by a man by the name of Donn Kellogg, who also owns all the designs and model names for the tires previously sold under the Clement brand. Due to a conflict of interest with the owner of the Clement name, the Pirelli Tire company, Donnelly has ceased licensing the Clement name and now all tires formerly branded Clement will now have the Donnelly branding. 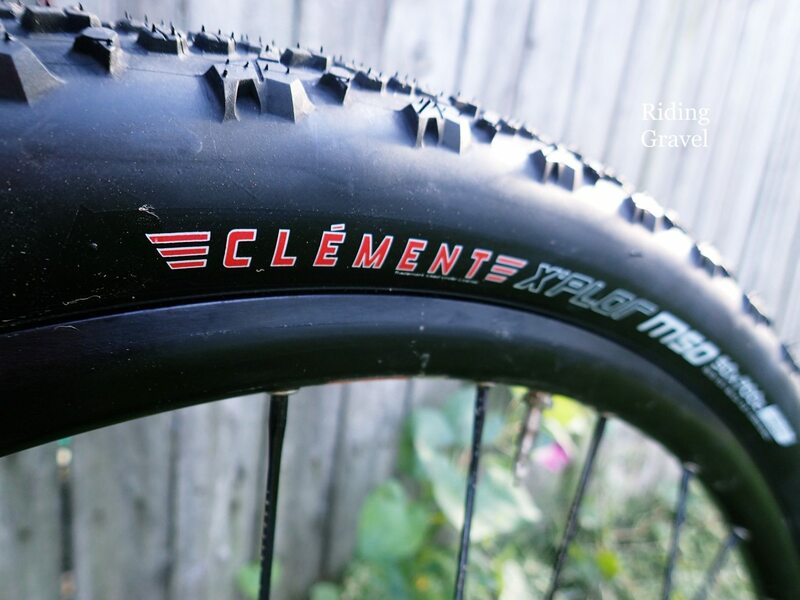 Our test samples still sport the “Clement” branding but going forward this tire will have the Donnelly branding on it. Same tire- just a different brand name on the sidewall now. The new tire branding will look like this. What It Is: The MSO 50mm tire is designed to be used as an “adventure” tire and as such, has a puncture protection belt under the tread. The idea here being that “adventure” may mean you are well out into the back country and a reliable, durable tire is a desirable thing to have. Well……unless you like walking your bicycle. It is important to keep this in mind first when judging against other choices in the marketplace. Another important aspect for such a tire design is being able to use it as a tubeless tire.The MSO 50mm is designed to be used tubeless, and when you handle it, it strikes you immediately that the sidewalls are beefy and the bead is as well. This will never be mistaken for a thin, supple casing. In fact, it feels as though the MSO could be ridden through the worst of rocks. I’ve handled hundreds of different tires in my reviewing duties and as a bicycle mechanic. These sidewalls and tubeless bead are some of the thickest feeling I’ve ever seen. Not dissimilar to a trail tire meant for mountain biking. Think of this tire as more of a “Rocky Balboa” than a “Usain Bolt” type tire. I expect that this MSO can handle a fair amount of abuse. The Donnelly MSO 50 tread is more pronounced and spaced differently than its narrower sibling’s tread blocks. This translates to weight. My samples both hit the “digital scales of truth and justice” at 750 grams a piece. Yeah………that’s heavy. There will be no getting around the fact that these tires are some of the heaviest tires in their class. For example; the Terrene Honali weighed in at a tic over 700 grams each as did the Teravail Sparwood tires which I have used before. To be fair, the Donnelly tire has a bit more tread depth than a Sparwood, so this is perhaps where the “beef” is coming from. The tread is, of course, a version of the popular MSO 40mm tire which many of you out there are familiar with. The tread design for the 50mm tire essentially is a bit deeper and a bit more spread out, especially in terms of the tread either side of the center strip, than the smaller MSO’s tread. 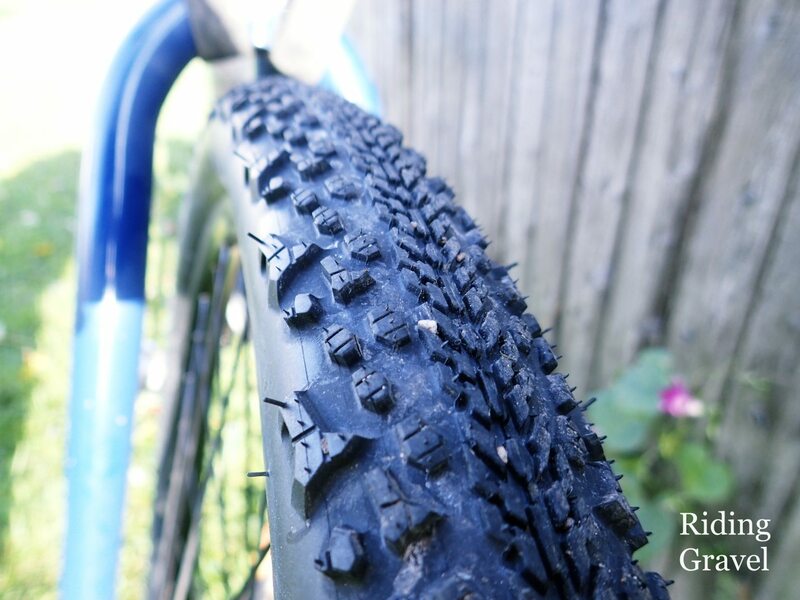 This gives the 50mm version the appearance of a mountain bike tire, albeit a skinny one. The casings measured at 51.4mm @ 30psi mounted on Bontrager Duster rims, by the way. The casing shape in concert with the slightly deeper knob height lend a distinctive shallow “U” shape to the casing when the tire is mounted up. The tightly spaced center strip of tread promises a faster roll and that shallow “U” shaped casing may lend a bit of stability in loose gravel. I will be checking that out as I get more rides in on these tires. Tubeless Performance: The Donnelly MSO tires were set up on some older Bontrager Duster TLR rims which use the plastic inner rim strip to seal off the spoke hole drillings. The MSO tires fit on these rims tightly, requiring a tire lever to mount the final section of bead. They pumped up with a floor pump rather easily. Air retention has been, as I expected, excellent. This is usually the case when a tire is constructed with thicker sidewalls like the Teravail Sparwood or this MSO tire. I expect no issues whatsoever with these tires being run tubeless during this review. First Impressions: While the Donnelly MSO 50 is a bit heavier than others in its class, I can understand the intentions for this tire to be a very tough, durable tire which one could rely on for bikepacking, heavy duty gravel use, or for mountain biking in areas that feature sharper trail nasties. I do not expect that the MSO 50mm tire will be like the Soma Cazadero 50mm tire I recently tested. However; unlike the Cazadero tire, I do expect that the MSO 50mm tire will outperform that tire and many others in terms of tubeless tire performance, toughness, and resistance to punctures. First rides on the MSO 50mm tires were done at pressures ranging from the lower 20’s psi to upwards of 35 psi. The tires seem to work better for me at the mid-30’s psi, but I will be trying a tic higher as well. The casings ride well and not harshly, as one might think based upon the weight and thickness of the sidewalls. They roll quite well as a result. I’ll have quite a bit more to say in my next update to this review. So Far……. The Donnelly MSO 50mm tires are an adventure tire with a bent towards the durability and reliable side with its thicker casing and puncture protection belt. It has a decidedly more toothy tread than other MSO variants and with its tubeless design, would make a good bike-packing tire. The weight is more than other tires in its class, but it seems to roll well in spite of that. Stay tuned for the “Checkpoint” update coming in a few weeks. Note- The Donnelly website is still in development. We will try to facilitate any questions you may have about the tires through our contact. Just hit us up in the comments or you can always reach me at guitarted@ridinggravel.com Note: The Donnelly (Clement) MSO 50mm tires were sent to Riding Gravel for test and review at no charge. We are not being bribed nor paid for this review and we strive to give our honest thoughts and opinions throughout. Are they making a 650b version too? @Noah_Duece- I saw that one option for 650B was listed – 650B X 42 tubeless ready- but my understanding is that this option is currently unavailable. I do not have an ETA on when that will actually become available either. If I find out more I will let you know here. I used these on Green Mountain Gravel Growler, and they worked great. I set them up tubeless using fatty stripper on some older velocity cliffhanger rims, and they setup easily. No flats or issues over 250 miles/5 days of the trips, and 5+ rides before that. 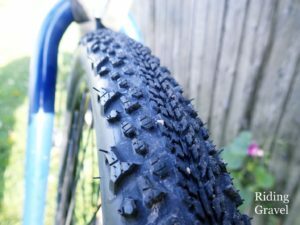 GT – Is there a rule of thumb for 650b tire size? IE.. My bike fits 700x 40 with room to spare. What size 650b wheels will I most likely be able to fit? Thanks, I totally missed your artical. Hey Ted, d you have any news on a new version of the MSO 40, that was supposed to be tubeless? I have yet to see them so I switched to the Kenda Flintridge PRO. Similar tread, but also like the MSO that I rode most of this year until Kansas. I rode the Kenda tires in the DK 100 and they rode very well, great sidewalls and no issues. Just wondering if the MSO 40 ever was actually released as a tubeless version. @Daniel Jaber- To my knowledge, that tire never was released as a tubeless model. I should ask my contact at Donnelly about that to see if I can get an answer at when that might happen, or if it ever will. Thanks for the question and thanks for reading! @Daniel Jaber- I asked my contact and I have been informed that this model, (40mm MSO tubeless), is coming, but no ETA as of now.